Hello!! 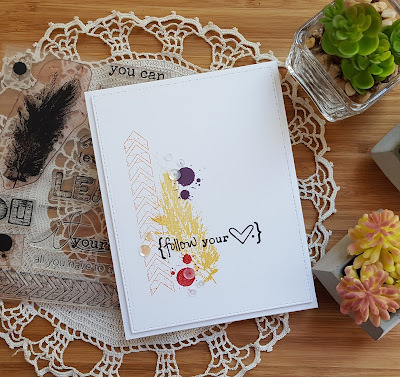 The weekend is upon us and I have a card to share for a couple of challenges: Essentials by Ellen Pin-Sights, Freshly Made Sketches and Simon Says Stamp Wednesday challenge of anything goes. 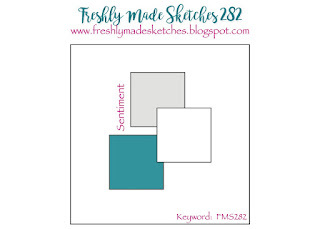 The pin-sights mood board is full of lovely images in soft, muted colors and I tried to capture several of those colors. 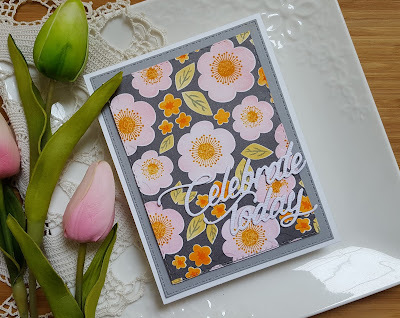 I used three different Essentials by Ellen stamp sets: Mondo Peony, Up the Happy and Lovely. 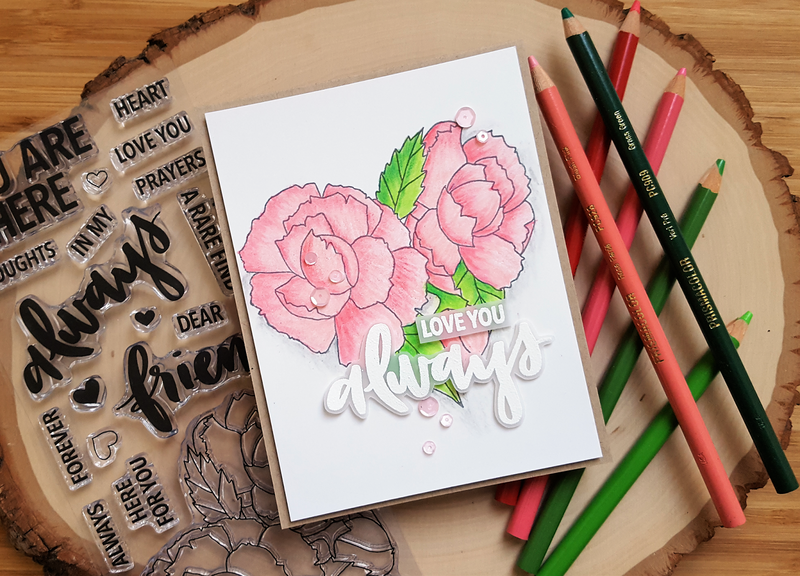 I stamped the smallest peony from Mondo Peony with watermark ink on watercolor paper and then embossed with white embossing powder. The flower was then colored with a ZIG clean color marker call Pink Flamingo. Once it was mostly dry I trimmed it out by hand. A background was watercolored using ZIGs in light green and yellow green. 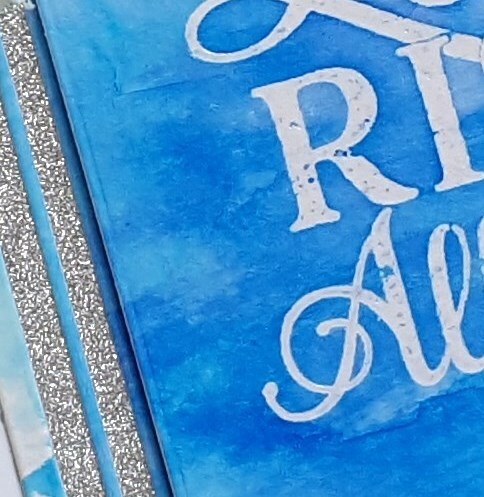 There isn't any silver in the images, but I decided to sparkle things up a bit by using silver glitter cardstock for the strip portion of the FMS sketch. The butterflies were stamp with watermark ink on watercolor paper and then colored with ZIGs in two shades of blue (blue and Persian blue). Once dry they were die cut. I trimmed down the main panel and then layered all of the images. For some reason I was a bit heavy handed with the ink when I stamped the sentiment, but I wasn't going to start over!! 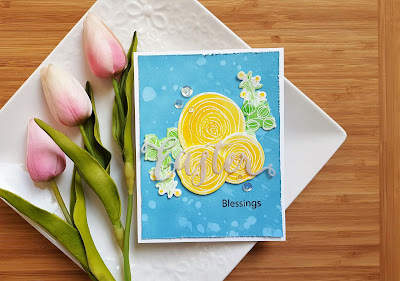 I finished off the card by adding some drops of Nuvo Jewel Drops in Sea Breeze. it's wednesday... it must be ajvd! Hope you will take the time to head over to the blog for a little look. 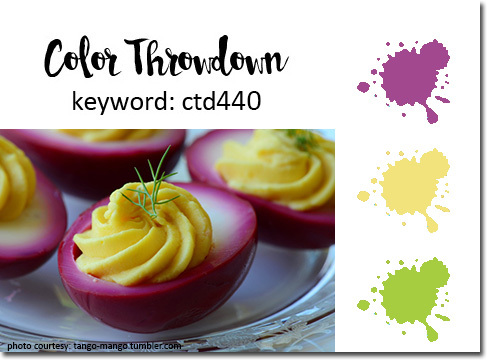 If you want to see my Color Throwdown card, please click here or scroll down. Also... I'm having a giveaway... please click here to enter. Hello friends!!! Happy Wednesday!! 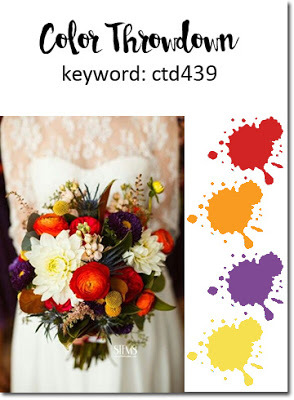 Stopping in with my card for the new Color Throwdown!! Lucky me... I'm the guest designer this week!! YAY!! And of course, the color combo is just gorgeous!! For my card I pulled out my never been used My Favorite Things Sketch Blooms 2 stamp set. I stamped the stems for the flowers using SU! 's Pear Pizzazz. For the magenta flowers I used SU! 's Rich Razzleberry and did generational stamping. I started by inking up the large solid image and then stamped it off twice to get the pale color. The smaller solid image was inked up and stamped off once before stamping and then the outline image was stamped using the ink at full strength. Love how the flowers turned out. The yellow flower was stamped with Close to My Heart Sunflower. I inked up the solid image, stamped it off once and then stamped. The outline was stamped at full strength. I filled in the scene with a leafy stem that was inked with Pear Pizzazz, stamped off and then stamped for a lighter green. Added in some little flowers with the yellow and magenta inks. The die cut hello is an MFT die and was die cut from vellum three times, stacked and then adhered to the card. For a little more interest I cut strips of cardstock in the same colors and adhered them behind the image panel. I'm also adding this to the current Simon Says Stamp Wednesday challenge of anything goes. 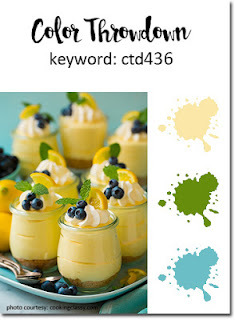 Wishing you a lovely day... hope you will play along with Color Throwdown this week! I have a giveaway going on here... click over and leave a comment for a chance to win a stamp set! 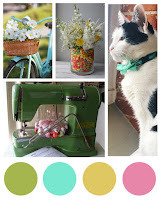 Happy PTI blog hop day everyone!! Nichole gave us a lovely inspiration photo and when I saw it I immediately thought of my Make It Market Mini Kit Color Pop: Floral. I love the stencils that come with the Color Pop kits. 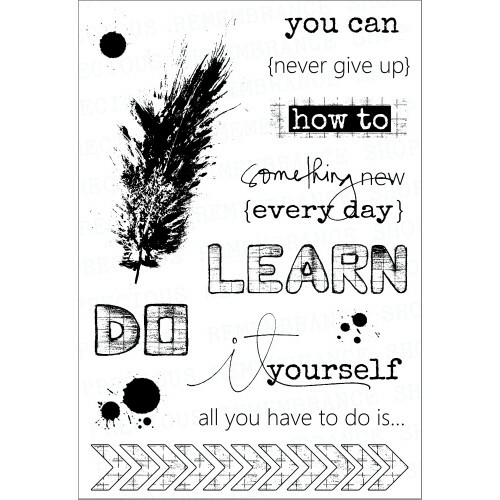 They are large, sturdy and cover your entire piece of cardstock! I pulled out my distress inks and used Spun Sugar for the large flowers, Scattered Straw for the leaves and Carved Pumpkin for the small flowers. After apply each of the layers with my ink blender I added the stems in the leaves using Weathered Wood, the centers of the pink flowers with Wild Honey and the centers of the little flowers with Carved Pumpkin. I die cut the piece with the largest die in the Double Ups Rectangles set. The sentiment was die cut from woodgrain cardstock and adhered to the panel. I die cut a piece of lighter gray cardstock as a mat and layered the two on a white cardstock base. Must admit that I wasn't super happy with the card when I first finished it, but it is starting to grow on me, lol! Have a wonderful day... can't wait to see what everyone has created! a card and a giveaway!! Hello!!! Popping in to share a card and some fun news!! Some of you may remember when I posted about my card being on the cover of the current issue of Stamper's Sampler and how excited I was about it. I was also excited because the card that was featured was made with some fun Precious Remembrance Shop stamps!! Dyane from PRS contacted me to congratulate me on this accomplishment and we cooked up the idea for not one, but two giveaways!! This month I'm giving away one of my favorite PRS stamp sets, DIY, and next month I will be giving away the stamp set featured on the card, Coffee Love... YAY!! So... on to my card! One of my favorite things about PRS stamps is how easy it is to collage stamp with the images and that is what I did with today's card. 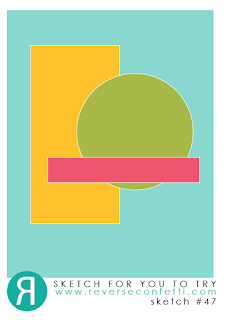 I used the colors from Color Throwdown so I will be posting my card there, as well. Not much to explain about the card. The sentiment is from another PRS stamp set called Positive Thoughts. Once the stamping was done I die cut the panel and then added some Pretty Pink Posh marshmallow sequins. The giveaway is super simple... just leave me a comment and I will pick a winner and announce it on my blog on Monday, May 1st. Wishing you a wonderful day!! Don't forget... comment to win!! Hey... happy weekend!! Yesterday was a gorgeous day here and in the evening my neighbors got their fire pit going. Once there were some nice coals we made our first s'mores of the year!! Unfortunately as this is the Pacific Northwest our nice weather has sort of evaporated...it is supposed to rain! Oh well!! After all that fun I finally got the photos I had take of a couple of cards edited and I'm sharing one today. 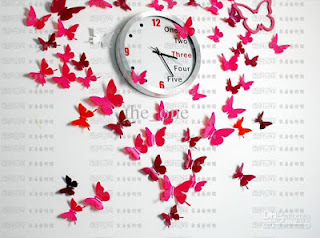 This one uses the current Freshly Made Sketches layout and since I used butterflies I will be adding it to the current Time Out challenge... don't you just love that inspiration photo??? I pulled out some older My Mind's Eye papers, found a couple I liked and got to work. 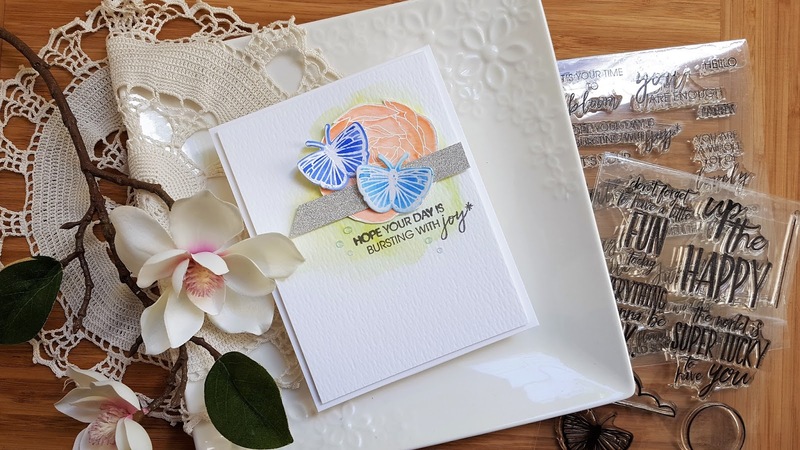 The butterflies are from the MFT Beautiful Butterflies stamp set. 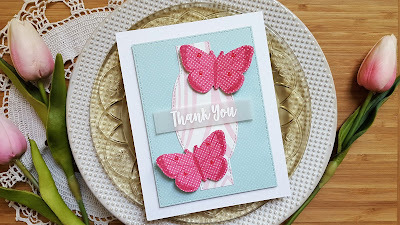 I stamped the butterfly using MFT's Ripe Raspberry ink and then die cut with the matching dies. I modified the sketch a bit by shrinking it down so that the MFT label die that I used wouldn't look so out of proportion! 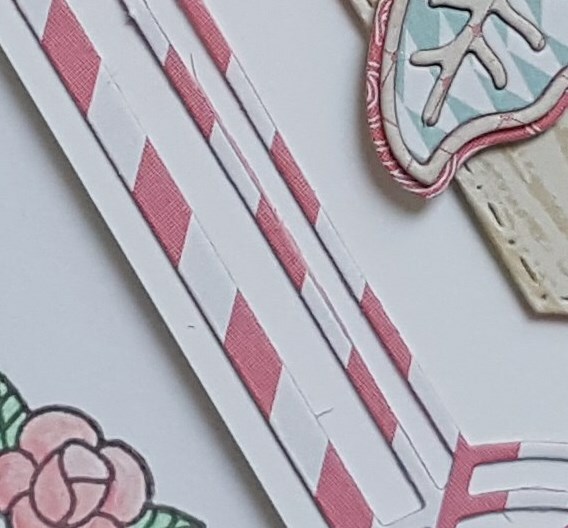 That was die cut from the light pink woodgrain paper. The background paper was die cut as well. Layered everything up and then finished with the sentiment (from the Beautiful Butterflies companion sentiment set) embossed on vellum with white embossing powder. Drops of Nuvo Crystal Drops in Morning Dew were added to the butterflies wings. A nice simple little card. Hello!! Hope everyone had a lovely Easter. Popping in with another card for the current Color Throwdown. Just love that combo and had to use it one more time!! 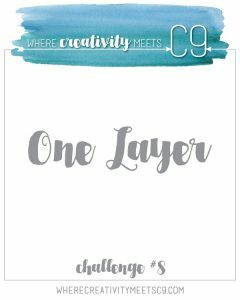 I paired it up with the current layout from CAS(E) This Sketch and the new challenge over at Where Creativity Meets C9 to create a one layer card. I pulled out the gorgeous C9 Hello Lovely stamp set and got to work. 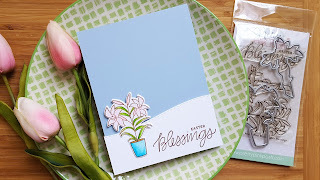 I wanted the outline of the floral image to be less noticeable so I used SSS Fog ink to stamp the image and then got to work stamping all of the watercolor like images in the set. These images don't fit perfectly within the outlines, but give it a looser look. I did some second generation stamp with some of the larger images like the large flower that was stamped in SU! 's Flirty Flamingo (a nice pinky coral) and the larger leaves (stamped in Pear Pizzazz). The center of the flower was stamped with Flirty Flamingo at full strength. Finished up with stamping the smaller flowers in SU! 's So Saffron and then all the little leaves with Pear Pizzazz at full strength. The large word lovely was stamped in black ink and then I embossed the happy birthday (from Beautiful Butterfly) in white on vellum. Trimmed it down and adhered it along with some clear sparkly sequins. 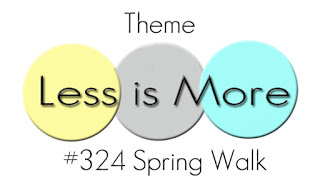 I'm going to add this to the current Less is More challenge of spring walk. Happy day before Easter everyone!! 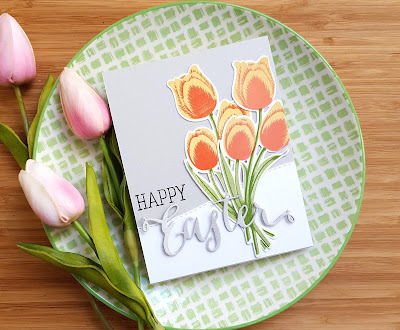 Popping in with two more Easter cards to share. 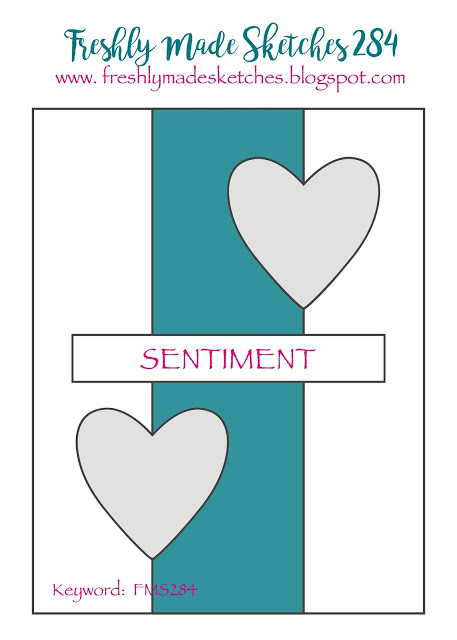 The first card is another take on the Reverse Confetti Sketch for You to Try. 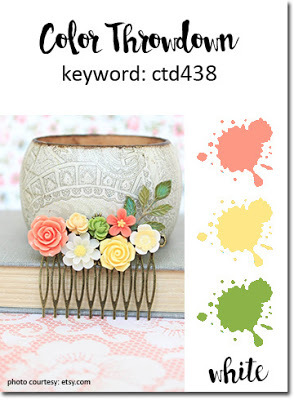 Ellen Hutson recently started carrying Reverse Confetti (YAY!!) and had everything on sale so I took advantage of the sale and got the Easter Blessings stamp set and the Tall Stripe Panel Confetti Cut. I really wanted to use both so I took a bit of liberty with the sketch to create my card. The paper is once, again, from the Bo Bunny Believe line. A lot of the colors are similar to those in the Simon Says Stamp Wednesday challenge inspiration photo so I will link my card up there, as well. Stamped the sentiment on a scrap of watercolor paper with VersaFine Onyx Black, scribbled on some blue using a ZIG and then loosely blended it out with water. 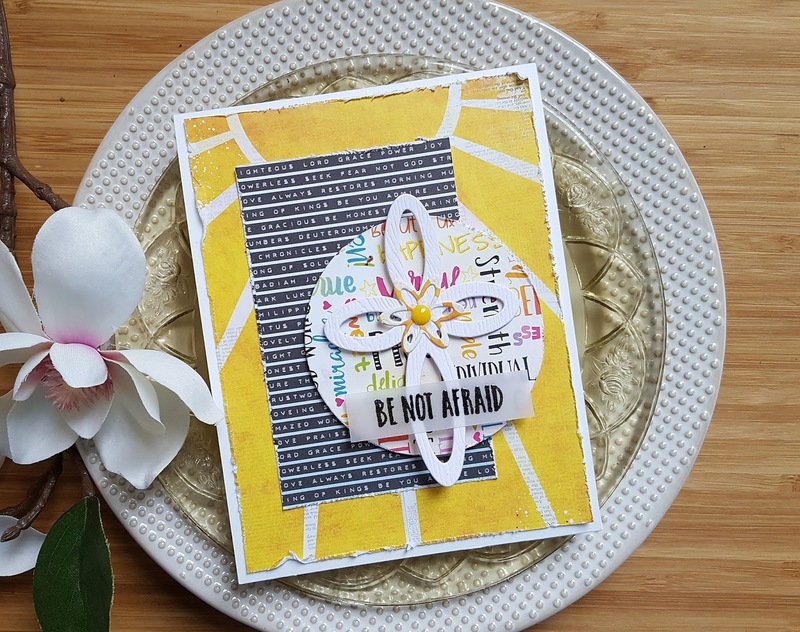 Die cut the sentiment and the mat using AJVD circle dies. The panel was die cut from a fun piece of paper covered in little hearts. 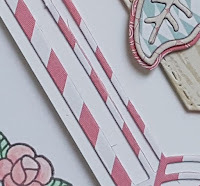 I thought it was a bit plain by itself on the card front so I die cut another Tall Stripe Panel from dark pink cardstock and then offset the two. Adhered everything and then added a few enamel dots in the same blue as the watercolor background. 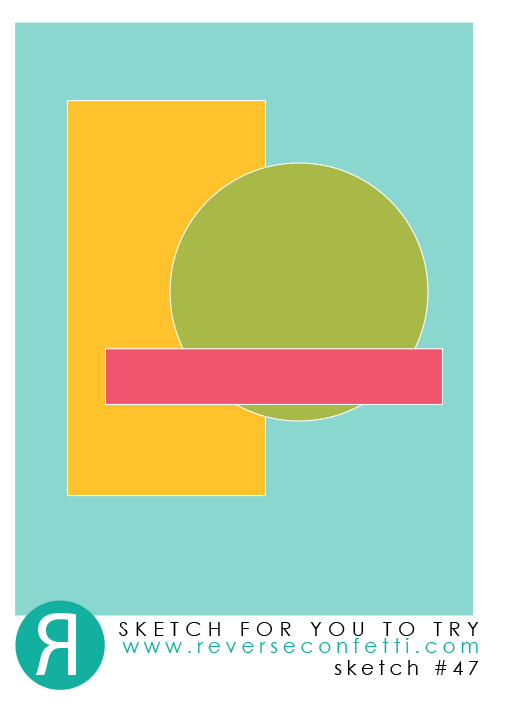 This second card uses the color combor from Color Throwdown, as well as the layout from Freshly Made Sketches. 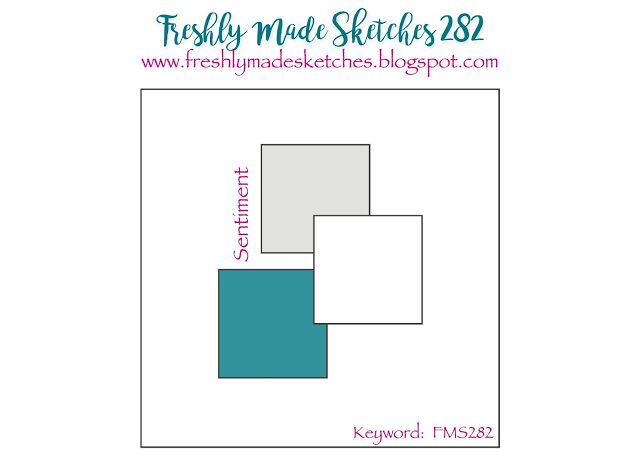 Love the simplicity of the FMS layout and just had to make something else with it! I pulled out my PTI Tulip Time stamp set and using my mini MISTI created my tulip bunch. The Color Throwdown palette includes coral and I know it is hard to tell that I used a coral ink, but I did. In fact I used two different coral colored inks. The tulip bunch in the front uses SU! 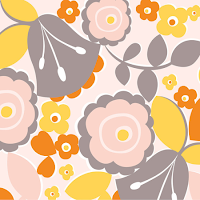 's Flirty Flamingo which is a lighter coral and the bunch in back uses Calypso Coral. Combined with the yellow they read a bit orange. The sloping piece was die cut with an AJVD Slippery Slope die and then adhered to the light gray card base. I stamped the word happy (from the Simon Says Stamp Happy & Smile set) using Onyx Black ink. Then I adhered the tulips. 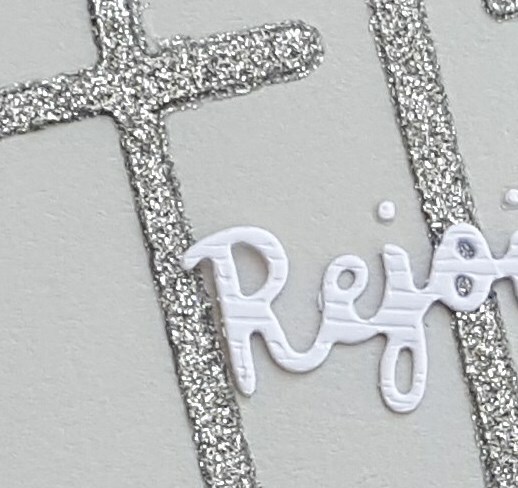 The word Easter was die cut from some shimmery white paper. The paper was rather thin so I die cut it again from a scrap of cardstock and adhered the two together. The word was adhered using some rolled up glue dots and I was done. This time I got the sentiment on the right side per the FMS layout!! Wishing you a wonderful and relaxed Easter!! Hello!! Easter is almost here!! On Wednesday I made a trip up to the town of Issaquah to get some Easter treats for my boys at Boehms Chocolates. 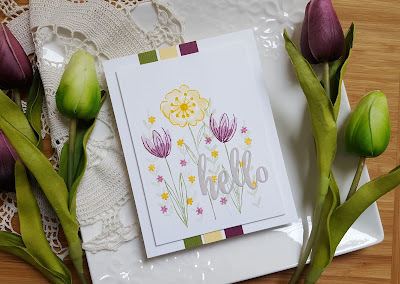 While I was there I picked up my most recent order from Ellen Hutson and when I got home I used one of the things I picked up to make the two Easter cards I'm sharing. Both cards use the current layout for Freshly Made Sketches and the sweet little Pretty Pink Posh stamp set Easter Blessings along with the matching dies. 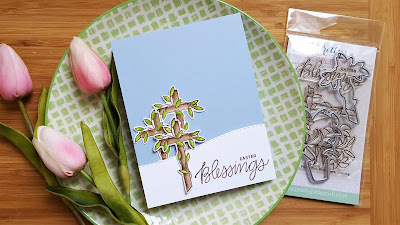 For the first card I stamped the vine covered cross three times on watercolor paper and then did some simple watercoloring with my ZIGs. Once they were dry I die cut them with the matching die. 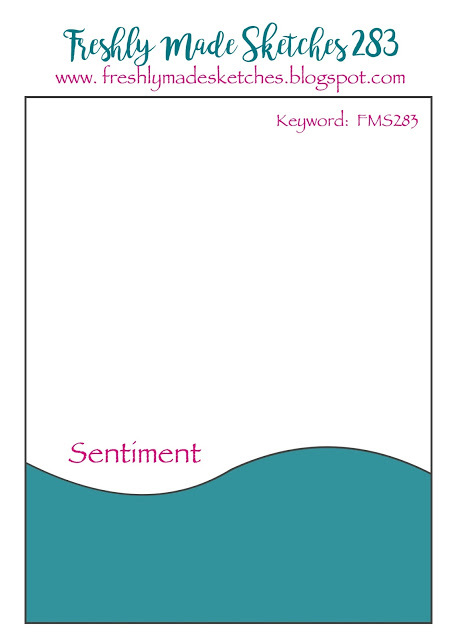 The FMS layout is really simple and so are both cards. I created to A2 cards from one sheet of light blue cardstock and then cut the white cardstock with a die from the AJVD Slippery Slopes and Stitched Clouds die set. The sentiment was stamped using VersaFine Vintage Sepia and then adhered everything to the card base as you see. I will be posting this card to the FMS gallery. The second card uses the Easter lily stamp from the Easter Blessings set. I also stamped that image on watercolor paper and did simple watercoloring with ZIGs. Once dry I die cut it with the matching die and then used the exact same layout for the card. 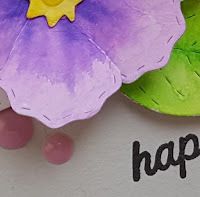 Since this one has colors similar to the inspiration photo for this week's Simon Says Stamp Wednesday challenge I will post this card to that challenge. Wishing you a wonderful day... I hope you will take the time to head over to the AJVD blog for a look and to let me know what you think. Hello!! Hope your week is off to a good start! My boys are back in school and probably not happy about it, lol!! As my blog post title indicates I have a couple of cards to share. First up is one for the April Reverse Confetti Sketch For You To Try. I wanted to make this an Easter card, but I don't have the RC set Easter Blessings so I used a sentiment from Walk by Faith instead. The papers I used are from the Bo Bunny Believe line. I got some of the papers in a Simon Says Stamp card kit last year and I really like them. I got a little funky with this card, but I really like it. The cross is from Reverse Confetti and I die cut it from woodgrain cardstock. The little flower in the center is part of the die set and was cut from a scrap of the Believe papers. I added a little yellow enamel dot to the center. I distressed the edges of all the papers before layering everything up. The sentiment was heat embossed in black on vellum and then adhered to the cross. 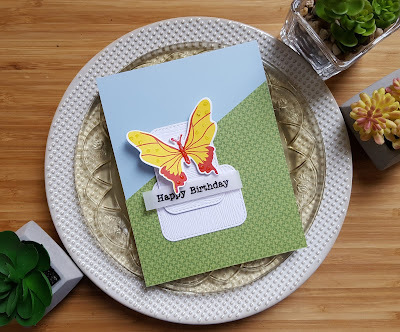 The next card is for two challenges: Color Throwdown and the Simon Says Stamp Wednesday challenge to make a birthday card. I started by trimming down some older My Mind's Eye green patterned paper into an angled piece and adhering it directly to a light blue cardstock base. The rectangles were die cut from woodgrain cardstock using the MFT Inside Out Stitched Rounded Rectangles and adhered to the card base. I stamped the butterfly from Beautiful Butterflies in MFT Daffodil ink and then layered the red (PTI Pure Poppy) on top with the matching detail stamp. I die cut the butterfly with the matching die and then added Nuvo Glitter Drops in White Blizzard to the body and little dots to the wings. Once that was dry I adhered it to the rectangle. 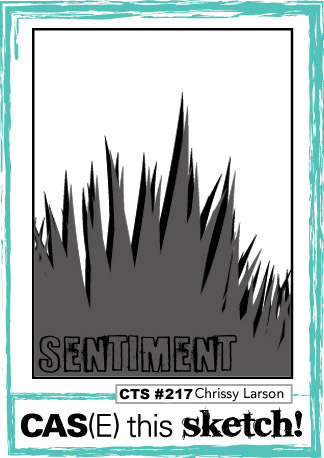 The sentiment (from AJVD) was embossed in black on vellum, trimmed down and adhered. Hello!! Hope your weekend is going well! We had a crazy windstorm yesterday, but thankfully things have calmed down! Made a card using the layout from Freshly Made Sketches. 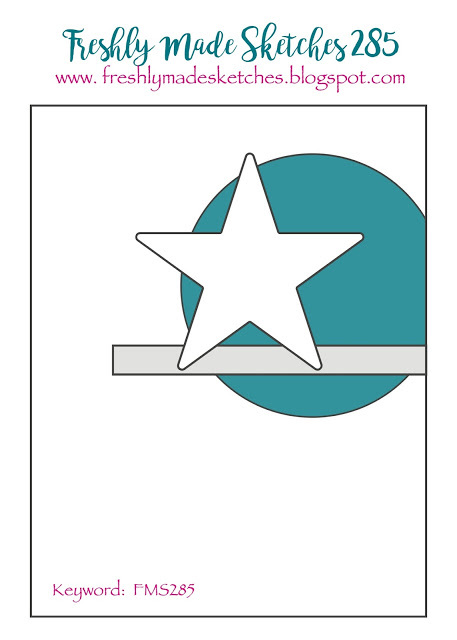 I changed the layout a bit by using a regular A2 size card and rectangles instead of squares for the elements. 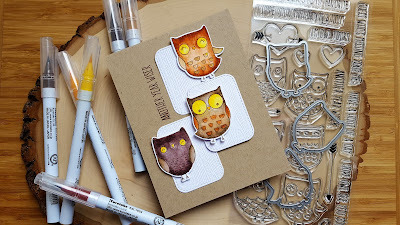 I have had the cute MFT Owl Yours stamp set for awhile and had not gotten around to using it. I thought the little owls would be perfect for the FMS layout. I stamped three of them using my MISTI on watercolor cardstock and then colored them with ZIGs. I'm not real happy with how they turned out. I definitely need to invest some money in a good set of watercolor brushes. I know what I want. I just have to put aside the money and get them. Anyway, once they were colored and dry I die cut them with the matching dies. The rectangles were die cut from woodgrain cardstock using the second smallest die from the MFT Inside Out Stitched Rectangles die set. I adhered the rectangles to the kraft cardstock base and then stamped the sentiment using VersaFine Vintage Sepia ink. 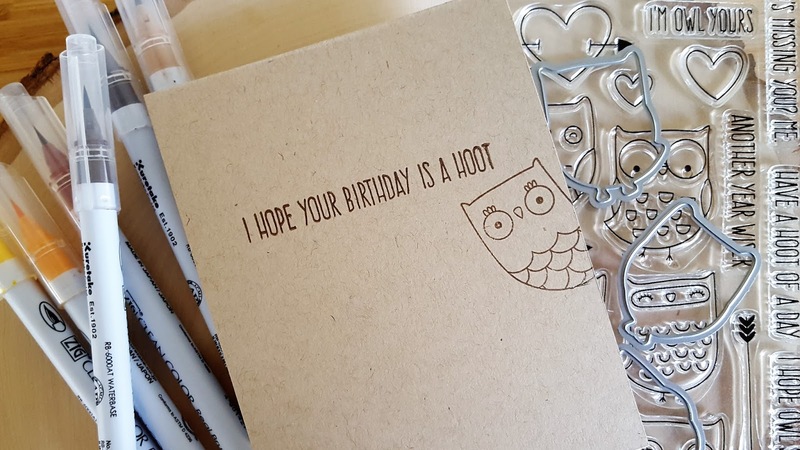 I finished off the inside of the card as well with another the birthday sentiment and another one of the owls. 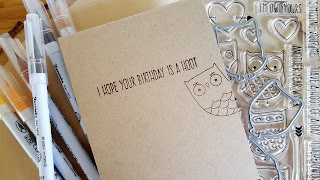 Since this is a birthday card I will also add it to the Simon Says Stamp Wednesday challenge to make a birthday card. I think I will be giving this one to my oldest brother for his birthday in a few months. Hello!! 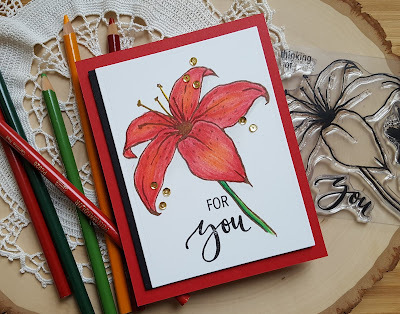 Stopping in with another card I made using a Concord & 9th stamp set and my Prisma color pencils. 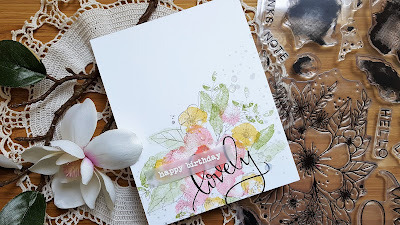 This time I used the beautiful Lily stamp set. 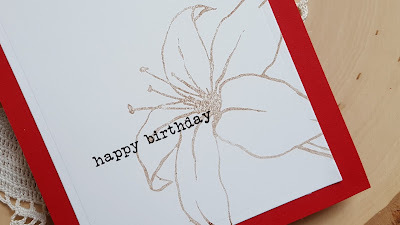 I stamped the lily on Bristol cardstock with VersaFine Vintage Sepia ink. Once that was done I googled what different lilies looked like and decided to try to color up a tiger lily. Like most lily varieties tiger lilies come in different colors including red with touches of orange. I used three shades of red and a yellow orange for my flower. Once I was done I simply die cut the image with a rectangle die, stamped the sentiment (also from the Lily stamp set) and then added a strip of black cardstock along one side before adhering everything to a red cardstock base. A few tiny cold sequins finished things off. I also finished the inside of the card with a simple partial image of the lily and then the sentiment "Happy Birthday" from the Concord & 9th Butterfly Beauty set. I pretty pleased with my coloring on this one, but I know I still have much to leave to achieve more depth of color. Going to add this to the current Simon Says Stamp Wednesday challenge to make a birthday card. Hello!! Spring break is on for my boys and we are getting out and about to do a few things, but last night I managed to find some time to make something. I have been doing a lot of watering with my ZIGs, but I decided that I needed to get out my watercolor pencils and see what I could do with them. Along with the watercolor pencils I pulled out my set of Prisma pencils. The watercoloring efforts were all fails, but I'm going to keep trying! What I colored with my Prisma pencils turned out way better and I turned it into a card. Last month I got several sets from Concord & 9th that included the set I used for my card, You Are Here. That rose-heart image is just gorgeous and begging to be colored!! I stamped the image on some Bristol cardstock with VersaFine Smoky Gray ink and started coloring. When I finished I simply trimmed down the panel and adhered it to a kraft cardstock base. 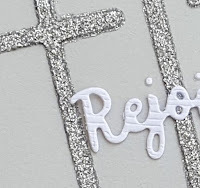 The sentiment was embossed on vellum with white embossing powder and then trimmed out. Rolled up glue dots were used to adhere the sentiments. Finished with some pink Pretty Pink Posh sequins. I have a ways to go, but I really like how my coloring turned out! There is still time so I will be adding this to the Simon Says Stamp Wednesday challenge of anything goes. Hello!! Feels like ages since I posted anything, but it has only been since Wednesday! Finally got some time today and made a few cards. The last one I made is for the current Color Throwdown challenge and I also entered it in the current Simon Says Stamp flickr challenge. I think I will add this to the current Simon Says Stamp Wednesday challenge of anything goes. I got to make a quick trip to a local craft store recently. They had the new Distress Oxide inks and so I used my coupon to pick up two colors to try out. 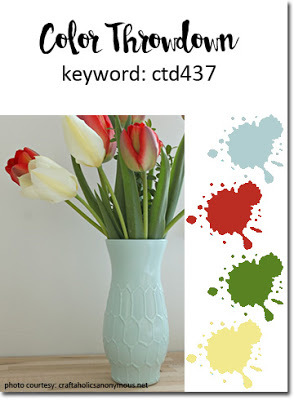 I used the Broken China since it works with the Color Throwdown combo. I inked up some Bristol cardstock with it and then flicked on water. I blotted some off and let some dry to create my background. The flowers (from the SSS set Sketch Ranunculus) were stamped on watercolor paper with watermark ink and then heat embossed in white. 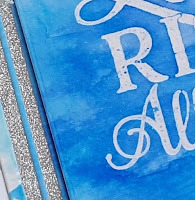 Then everything was watercolored with ZIGs and die cut with the matching dies. Once I got everything arranged and adhered I stopped to figure out the sentiment. 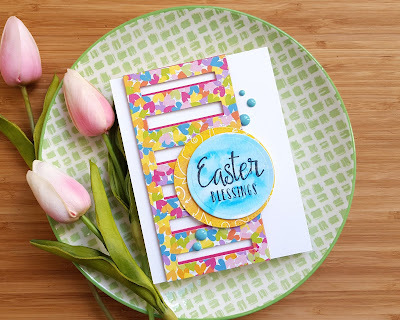 I decided to make my card an Easter card so I got out the SSS Easter die, cut it from vellum three times and adhered them together. The sentiment is from the SSS Rejoice! stamp set that matches the Easter die. I stamped that in black ink and then adhered the die cut word. A few Pretty Pink Posh sparkling clear sequins finished things off.